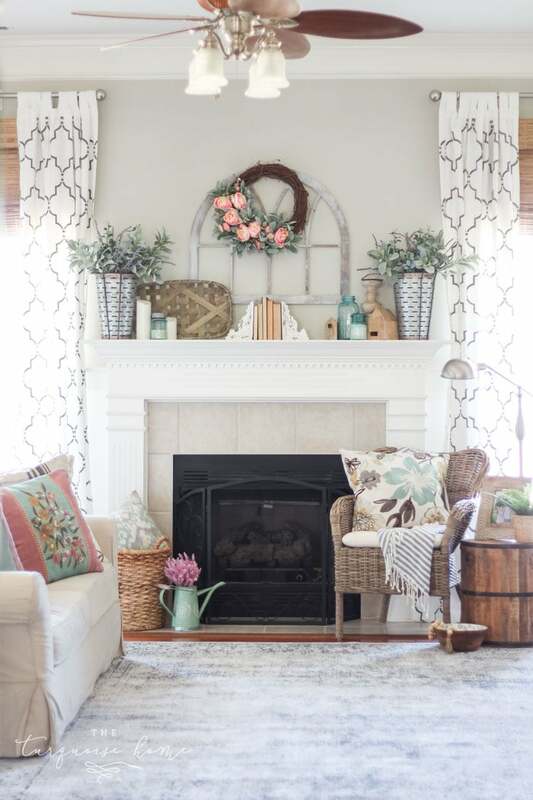 This gorgeous living room makeover has beautiful DIY board and batten, Pottery Barn sofa, stenciled curtains, warm wood and pops of turquoise! Well, here it is folks: my new living room with the new pillows, blue accessories, board & batten, gallery wall and gray paint. It’s still my living room, strewn with toys most days. The pillows are usually being used as a launch pad on the floor, and there’s typically little bitty popcorn pieces in every nook and cranny. (I’ll share a glimpse of real life at the end.) But the vision I had when I walked into this house is finally coming together. It was your basic builder’s beige living room. Nothing wrong with it, just needed some personalization. Ahhh, so much more light, bright and calming now. I am calling this a “reveal” in the title, but it truly is still a room in progress. I don’t know if I’ll ever call a room completely done, but this is a good stopping place. I hope you like the changes I’ve made! And yes, I put my watermark on that picture. Makes me laugh. Ha! I was planning on giving the board and batten tutorial today as well, but I think that would be a little too long of a post. So, I’ll share the details probably next week sometime. Until then, enjoy your weekend! Are you doing any sprucing up around the house this Spring? What do you think of my living room? Cozy Coupe – from Target – haha … I know you wanted one of those! Love your home! I am planning to paint my kitchen Rockport Gray. I’ve been thinking a lot about Revere Pewter for the living room (separate rooms, like yours looks with the opening leading into the kitchen). Do you think those two would look good together? Too close, too different? I love your living room!! It makes me want to redo my whole downstairs! What color paint is the grey/tan color? Love your living room! So warm and inviting. Random question – what color is your PB couch? Well, I’m not exactly sure. We bought it off of Craigslist, so I didn’t get the info from the guy we bought it from. If I were guessing, it’s definitely twill and I think it’s most likely the cream color. I keep meaning to take a cushion cover in there to see for sure. I will warn you about the PB grand sofa. I love, love, love that it’s deep and comfy. There’s plenty of room for two adults to curl up on it and be comfortable. I also hate that about it. When we have guests over, especially older guests :), they seem to get lost in it and have trouble getting up from it. And now that I’m pregnant, I kind of have trouble getting up just because it’s so deep. AND next time I will get a couch with three pillows on the back. Two cushions make it comfortable for two people only. The third person in the middle has to fight with the gap in the cushions. Super uncomfortable. I stumbled across your blog after leaving a question on Houzz. 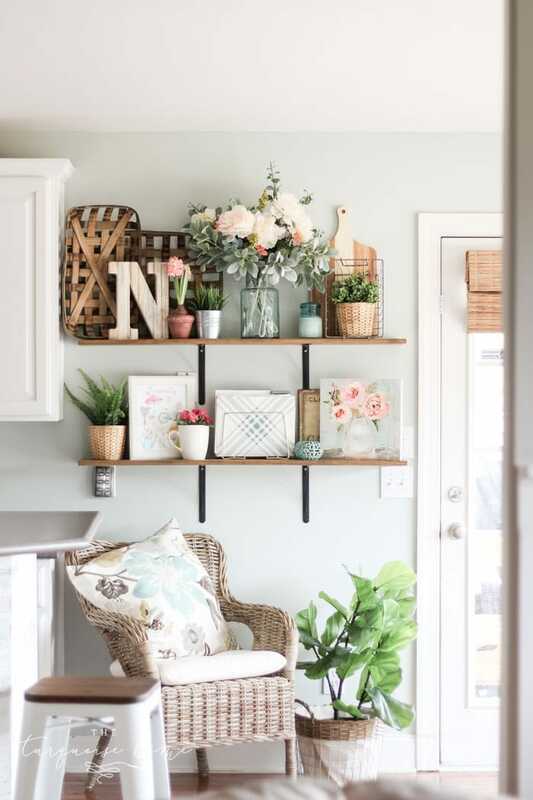 Your paint choice turned out beautifully, and I laughed while reading because my kitchen is turquoise and I’m looking for a paint for entry, living area and two hallways! My turquoise is deeper, Ash Blue by Benjamin Moore. I love it and it works well with my wood cabinets and floors. I made a hasty decision with my painter to use Antique White in the above mentioned areas and I just do not like it – a bit too yellow. I have an eclectic mix of custom-framed Southwest paintings and bull terrier artwork and I’m thinking a griege paint like your Revere Pewter would work well. What do you think? Love the room. Can you tell where you found the x-back chairs? Thanks!! 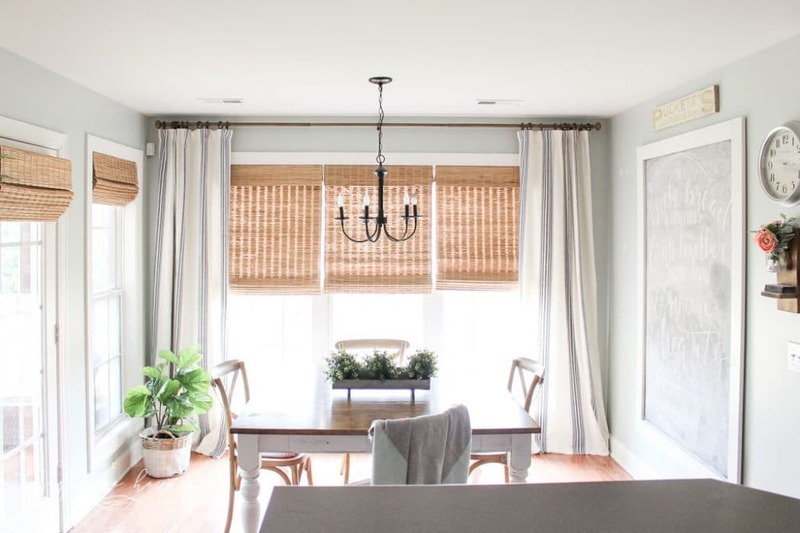 2 questions…what did you use to apply the paint to the curtains? And secondly, where did you find the large stencil? Ok maybe 3 questions. I love the color on my walls, do you think i could use that paint, to paint the curtains? I think you can use any paint you want! 🙂 Just add fabric medium to help it keep from cracking on the material when it dries. 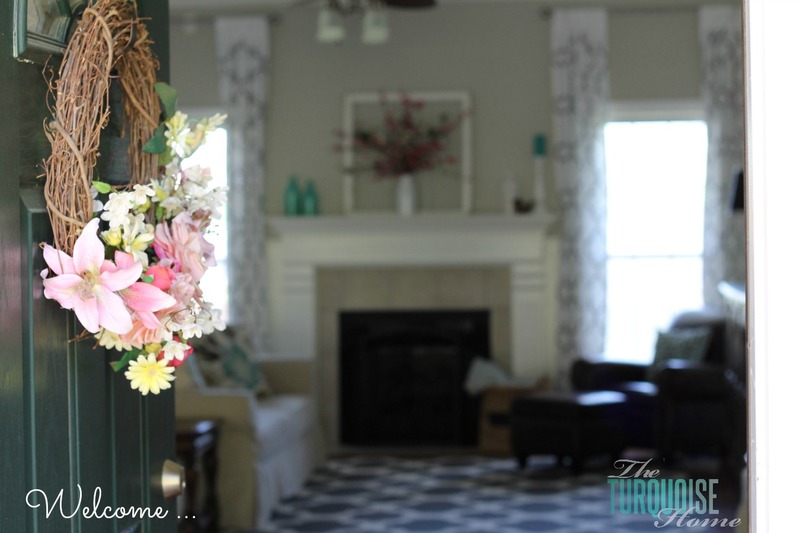 Could you tell me where you purchased the pink flowers on your mantle? I was wondering if you had to paint a primer on first before painting the walls with Revere Pewter. My existing walls are similar to your before pic. I love what you did. Any tips about painting the ceilings and walls…..paint brushes, tools, etc. Love your style. My living room looks very very similar it’s funny! I should show you pics. Where did you get your curtains? Thank you for sharing! Hi! I LOVE your living room paint color? Could you tell me what the color is and where you purchased it? Hi Erika, it’s Revere Pewter by Benjamin Moore. What is the paint color in your kitchen? Beautiful living room! Hi Cindy, I know I replied to you via e-mail already, but in case someone else is reading this and wants to know – it’s stratton blue by Benjamin Moore. Thanks for stopping by! Hi Laura! I’m a new follower, having found you at Cozy Little House. I like the name of your blog. I’m going to spend some more time browsing your lovely blog, but I wanted to take just a moment to tell you how much I like your living room. You have great style and have made your room a reflection of your own personal taste. The board and batten is wonderful. 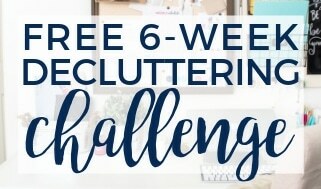 I’d love it if you’d share this post at my monthly blog party Every Room In The House. We’re partying in The Living Room this month and your living room would be a delightful addition. Thanks so much for the sweet comments, Nancy! It’s great to have you here!! Ha!! Thanks so much, Kara! You have a beautiful home and great taste! Your work truly is impeccable! Thank you for the inspiration. I am doing my living room almost exactly like yours with the gray. I have an entry way that opens into the living room, It currently has an ugly octagonal brass ceiling fixture. I want to update it but I am not sure of what to put there. I am leaning towards a drum shade of some sort. Any suggestions for me? Hope this helps! And good luck!! I really love the turquoise in your kitchen! What is the actual color and who makes it? Hi Tonya, it’s Stratton Blue from Benjamin Moore. I love it! Where is your leather chair from, its great!! 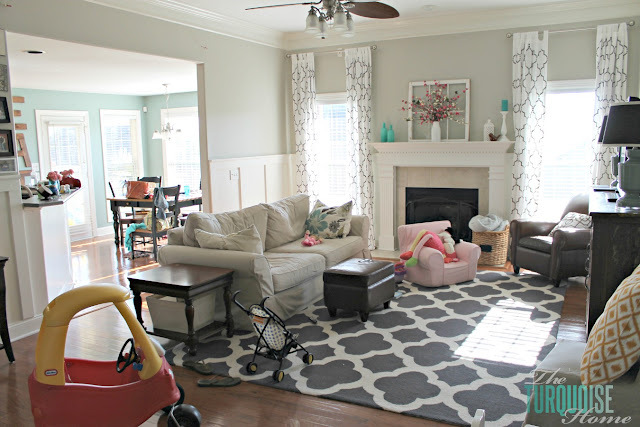 It looks wonderful AND so glad to see the photo of what your house looks like on normal day, toys and all! Thanks so much, Megan! Have a great weekend!! Love the make-over!! Please tell me where you found your slipcovered sofa and if you love it. Looks exactly like what I’ve been thinking but didn’t know how easy it was to truly keep it clean. Thanks! Hi Kristen, the sofa is the Pottery Barn PB Comfort Grand Sofa. We bought it on Craigslist after I stalked CL for months! But you can buy them from the store with a whole lot less hassle. It’s huge and super comfy. 🙂 I’m pretty strict about what I allow in my living room, so there aren’t many accidents. But, when there are accidents, I just throw the covers in the wash and they’ve come out looking great! I don’t dry them in the dryer, though. I just line dry them and then iron them. I’ve maybe washed them three times since we got it last summer. I hope this helps! We’re looking to buy the PB Comfort Loveseat to go next to it soon! 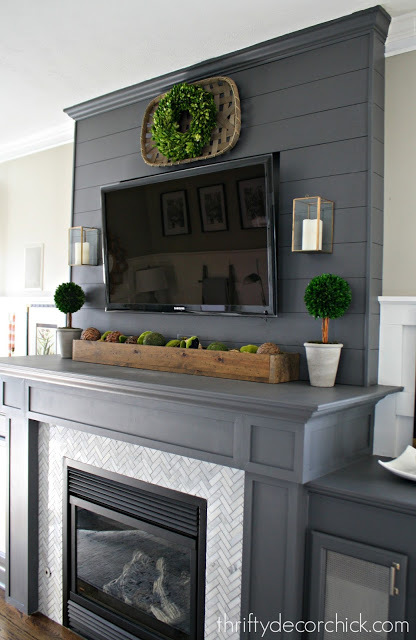 i’m sure you mentioned it already, but I just found your blog and I love the gray paint color in your living room!!! who makes it and what’s it called? Haha!! I’m glad you found the post. It’s one of my most visited. Evidently people have a thing for finding the right gray paint. I still love it so much and would paint it Revere Pewter all over again. 🙂 Thanks for stopping by! Aww, thanks so much, Angel! 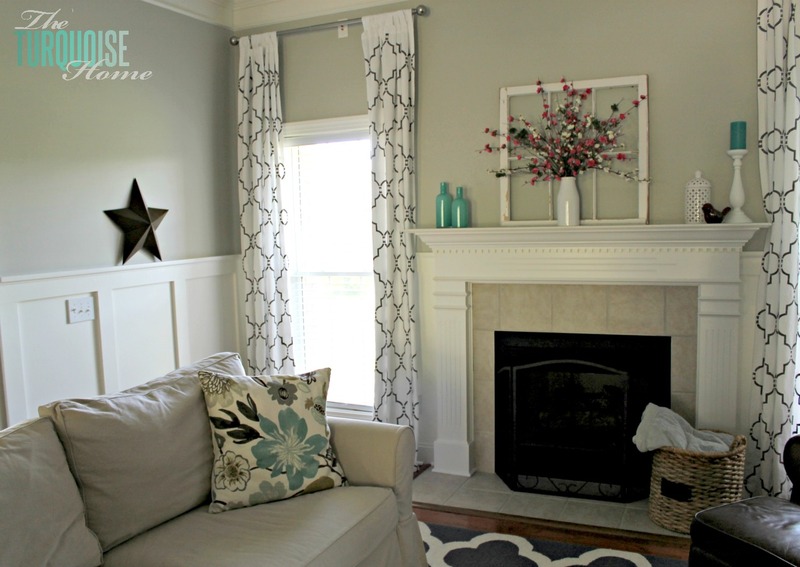 Can you post a link to your living room curtains…where to buy? I love the entire room…. love this, especially those curtains and rug!!! Featuring you on the blog and sharing on FB tomorrow! Thanks so much for linking up with OPC and the DIY village to support Habitat4Humanity. Hope to see back tomorrow night. I’m just snooping around your blog today. And I want your living room rug. Bad. Watch out – I may come steal it! Gorgeous! You should come visit … and then you can drool over it in person. So inexpensive from RugsUSA.com. Hi Laura! Just found you today via Lauren, from the Thinking Closet. Hope you’re having a fab time at the Haven conference! I love your living room makeover. Boy, what a difference paint can make! 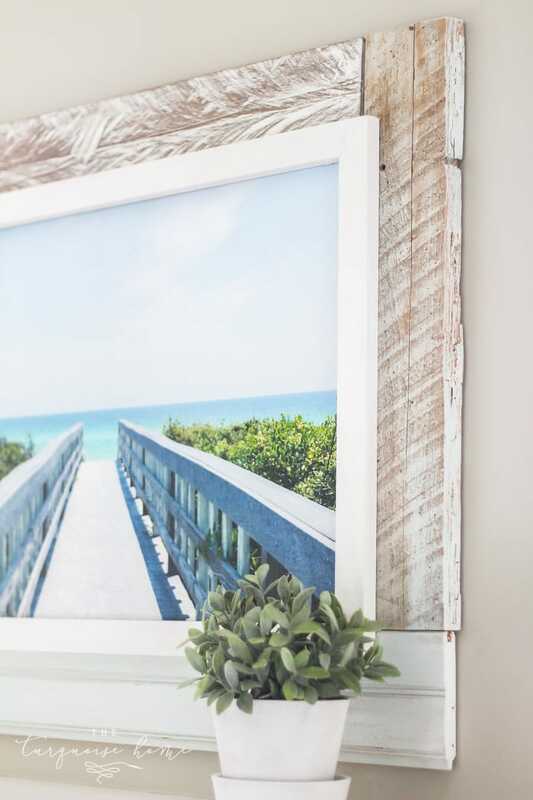 I love your board and batten walls! job on your gallery wall! Now I’m going to stop talking and take a look around at some of your home projects. Aww, Sandy … you’re too sweet. Thanks so much for stopping by and I hope you’ll continue to stick around. Off to check out your blog!! Where did you get your awesome rug? 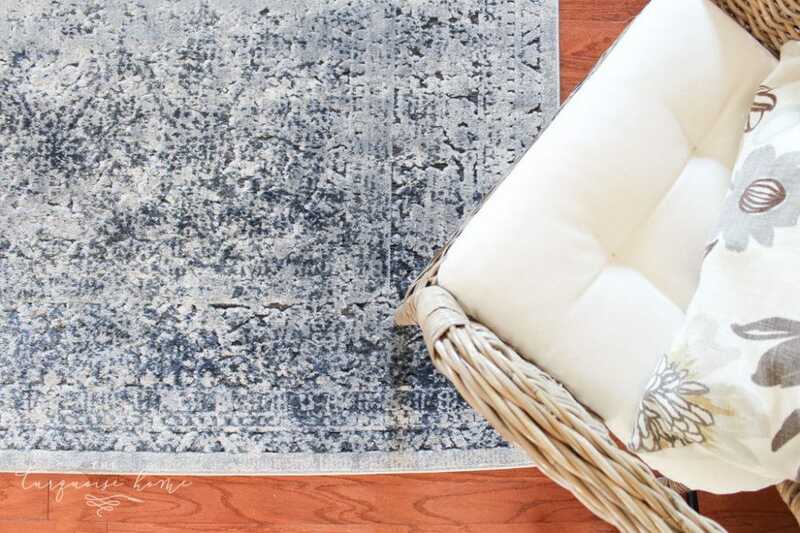 It’s the Moroccan Trellis rug in Charcoal from RugsUSA.com. I absolutely LOVE it! I love it! It looks so cozy and beautiful! I am in the midst of a whole house redo. My rug I bought for my living room looks a lot like yours! ok i love that you sourced the cozy coupe! hahahahaha. Awesome board and batten. I mean wow. I’m drooling. Can I come live in your home, pretty please?!! Hi Laura! I LOVE this room! LOL I scrolled to the bottom of your comment page, and the comment right above this one says almost exactly what I was going to. My current home is much more beige, brown, dark red, sage green…which I loved 8 years ago. However for our new home (currently being built! We’re blessed, certainly not rich!) 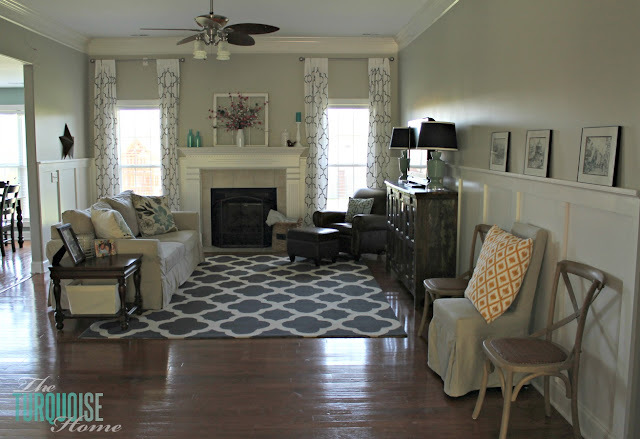 I want to go grey in the main rooms (a great room including living,dining and entry, and open to the kitchen and 2 hallways) and your photos were so helpful! I love that they are feeling bright and fresh (my goal!) and not cold (my fear as well). I also LOVE all your projects for this room, and will be copying at least a couple (probably the curtains first!). One other random question- in the very first before photo I noticed your wood floors run in 2 different directions (for lack of a better term, vertical in the entry and horizontal in the living room). 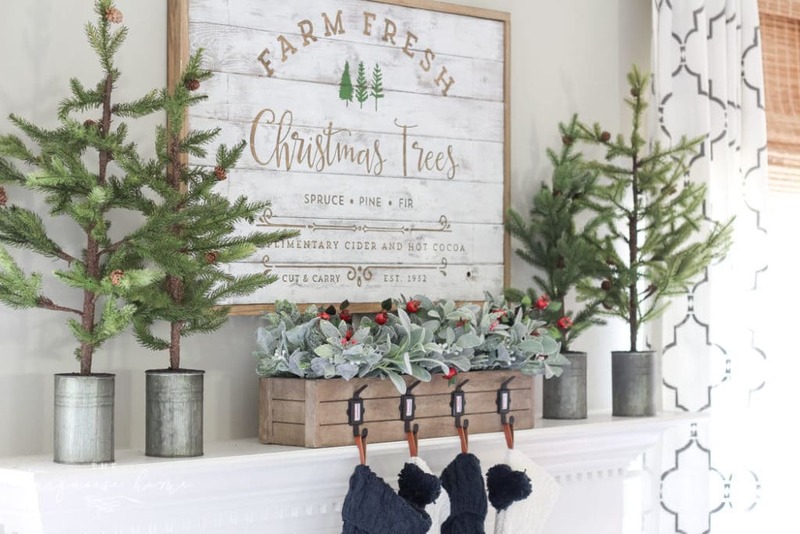 We are considering doing this in our new home because we have a long, 7ft wide entry, and then a very long perpendicular room that houses the living/dining areas (sort of making a T). I’m not worried about the look of the actual transition, I’m just worried that the switch in direction will bother me when I stand at the front door and can see into the house and the wood going both directions… Do you notice where your floor direction changes? Does it bother you? I don’t know if you laid it but I doubt it since it was in the before shot; would you have done it differently if you could? I know it’s an odd question but as I was looking at your pictures, I said Aha, thatis what we’re considering, wonder whatshethinks aboutit? I love your home and I think you have amazing taste, so I would appreciate an opinion if you have one. Thanks again forsharing your home and in advance for answering my odd question 🙂 I agree that no room is ever “done”, but even so, I think you have completely acheived your goal of a bright, fresh welcoming space! I wish we were neighbors! Hi Julia, so funny that you noticed my floors changing directions. Ha! 🙂 We did not build the house, so it was that way when we bought it. So while I know the floors are different directions, it doesn’t bother me one bit. I think it actually helps define the large living room from the kitchen and the entry way. I’m not really sure why they changed it when they built the house, but it’s not something I ever really think about. So if you are still considering doing it in your house, I say go for it! Thanks for stopping by and leaving a comment!! I’m loving my new cooler colors. I thought it would feel cold, but it really is just brighter and feels so much fresher. Thanks for stopping by and leaving a comment! Another blog I must read every night!! I love your style. 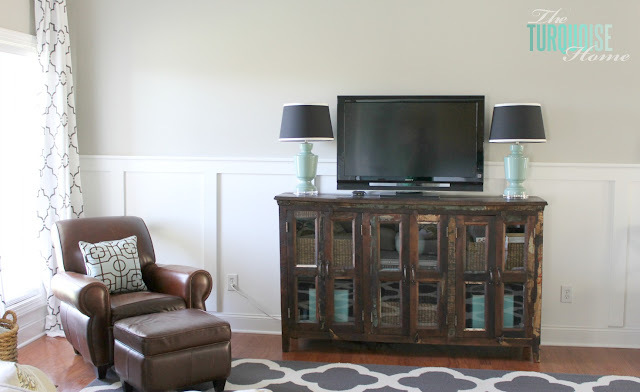 Did you paint your tv console? I love the whole room. Will you come decorate my home??? Hi Robin, I did not paint the TV console… I got it at Nadeau. I love it, though! 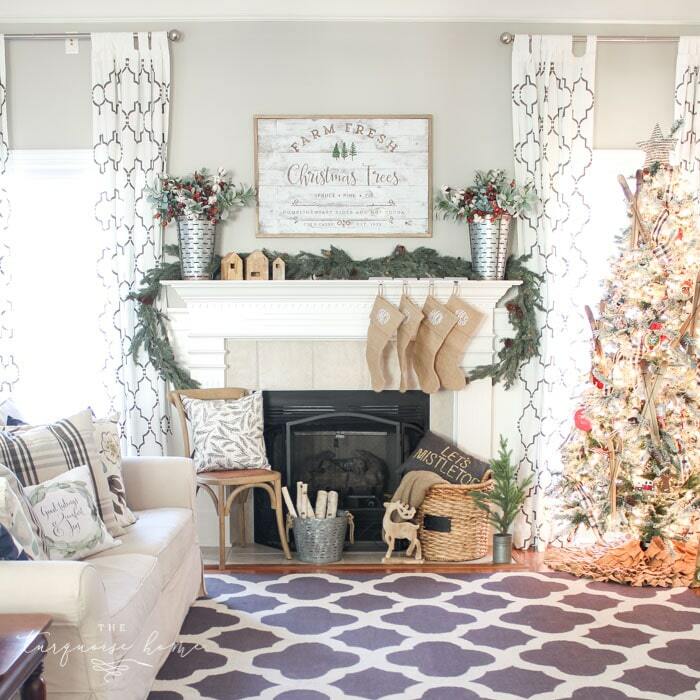 I wish I could just finish decorating my own home! HA! There’s still soooo much work to be done!! Hi Laura, gorgeous room. Where did you get the aqua flowered pillows on your sofa? Hey Laura! Coming to visit from the Haven link up. I saw in your other post you said you used Revere Pewter in here. It looks awesome! I’d love to feature this on my paint color blog. Let me know if you’re interested! Wow. I love your living room. Great job. Love the rug and curtains. Wow! Love the transformation…very calming and beautiful! Where did you get the chair slip cover? I love your style! You did an amazing job!! Outstanding! I’ve gotta share this with my sister! Color really does make a difference! You did a marvelous job! Love all the pops of blue throughout! Your room really turned out lovely. Visiting from Grace at Home Party. Will follow you on FB. Your room is just beautiful. You’ve done a great job, and I know you must be really proud of the result. Way to go! Thanks for linking this to the Grace at Home party. I featured you this week! I want to live here! It’s the perfect combo of pretty and cozy. Where did you get your couch, love the room!!! Your room is beautiful! I love the colors – it looks so very peaceful! Pretty color update! And I love the use of all the graphic prints – very fresh! Oh this is fabulous, so pretty! Featuring later today! 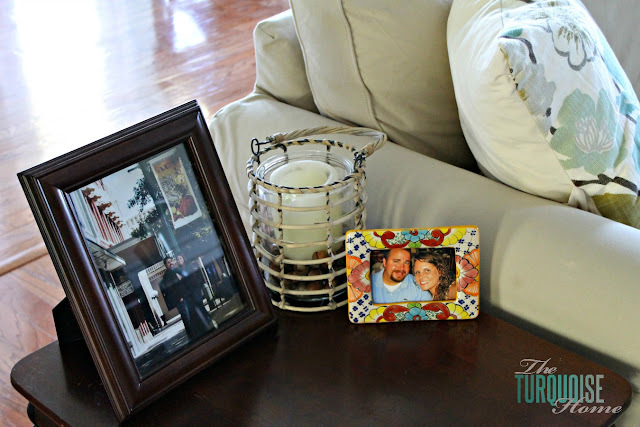 I featured your amazing living room today! I also pinned it to my linky party pinboard! 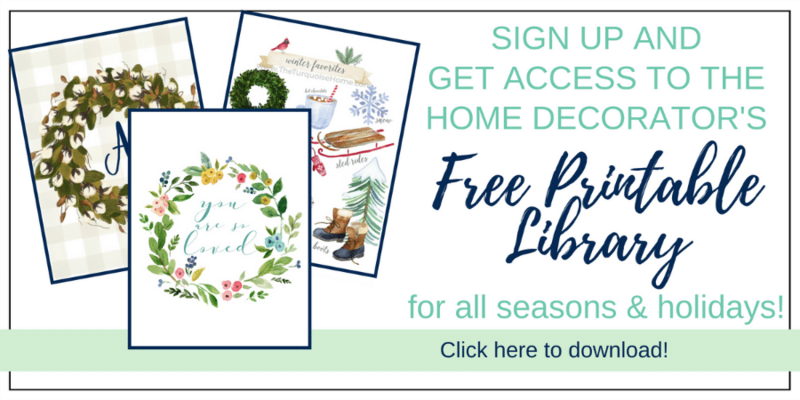 Thanks for sharing at Project Inspired Linky Party! 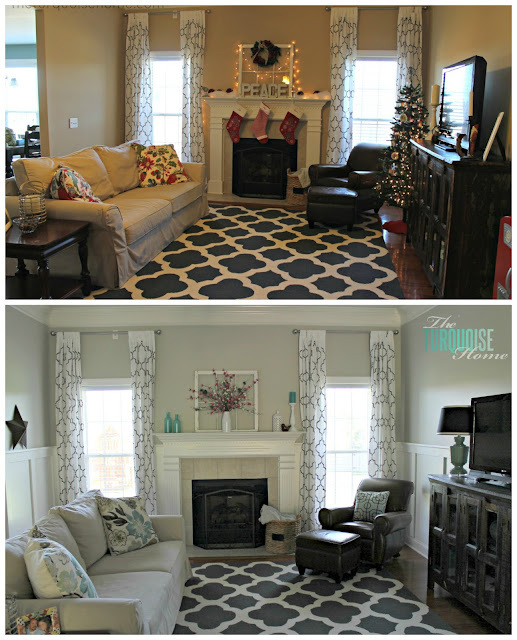 Thank you for linking up your beautiful living room transformation to our Simply Create Link Party! We loved your transformation so much we featured it today! I love the new grey walls! 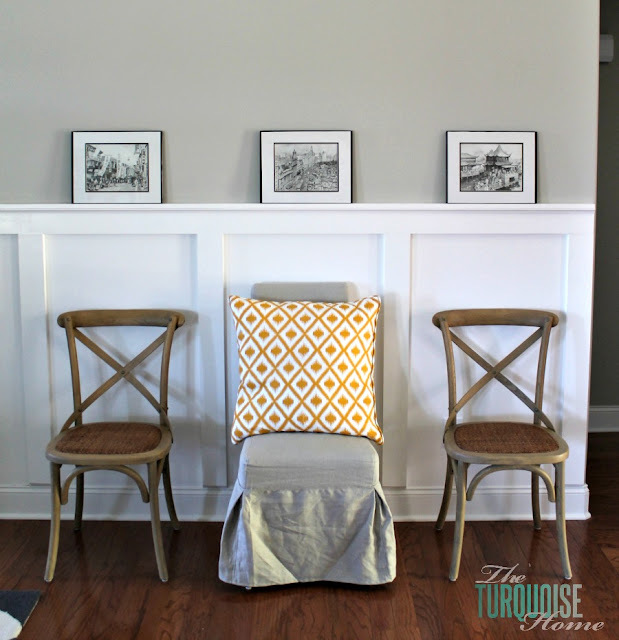 We went from a beige-y yellow to grey and are loving them too. You accessorized the room really well too! I love it! We are looking for a similar rug and I would love to know where you got yours and if you like it!! Ours will be on carpet until we change out the flooring so I need it to be thicker! 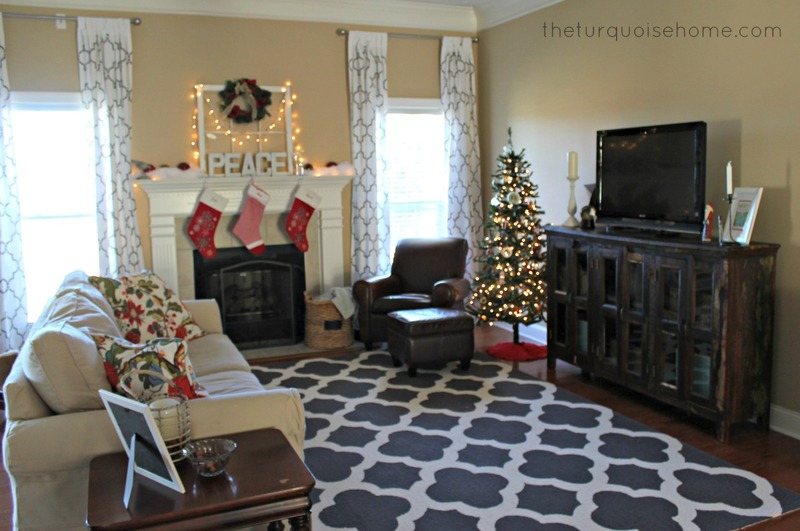 Hi Lorie, the rug is from rugsusa.com. I snagged it at their black Friday 75% off sale. It’s the Neid Trellis rug in charcoal. such an amazing difference the wall color and board and batten paneling have made. just beautiful!! I’m featuring this post on Be Inspired this Thursday! Oh wow! thank you so much!! Amazing! You did a great job and it looks amazing! 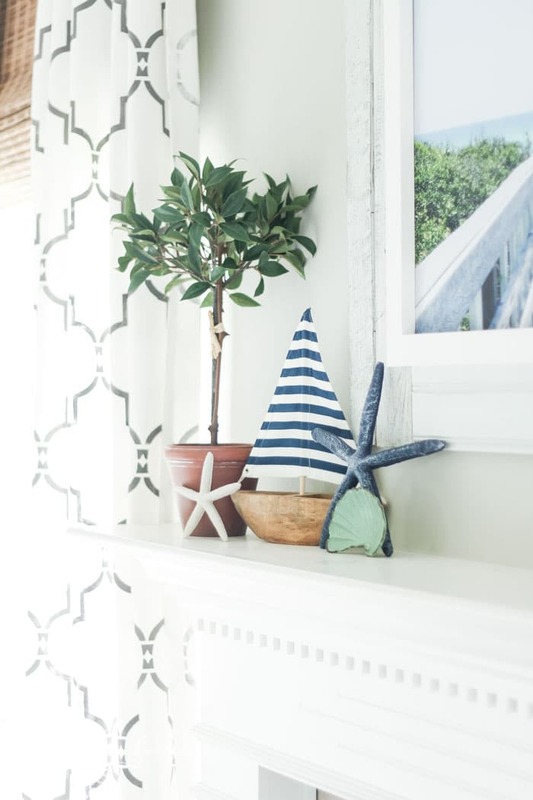 I love homes that make your jaw drop but also are inviting and says to guests “You can relax.” That is what I am trying to accomplish in my home. Oh Chrissy, that is such a sweet comment! I am flattered that you think that about my home because that’s exactly what I want to convey … a “please come in a relax” vibe. Thanks for stopping by! Great room! I think the Cozy Coupe is a nice touch. (It is my favorite accessory in my living room too, ha!) Great job! Usually the Cozy Coupe is joined by a wagon, a baby doll high chair, and more random toys… I just happened to pick a “good” day to take a messy pic. Ha! I found on on Too Much Time. I love your living room and the colors are perfect! 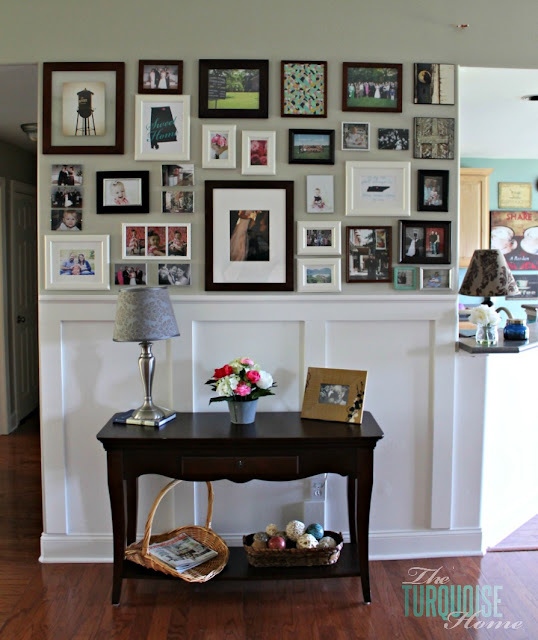 The gallery wall is perfect! Lovely room! I know exactly what you mean when you say you are not sure if it will ever be done, I feel the same way about my whole house! I think that’s the fun of it! This looks great, and I love the blue wall in the kitchen. What color is it. Hi Debi and Charly, the color in the kitchen is Stratton Blue by Benjamin Moore. I looooove it! I’ll be sure to stop by this week for your blog hop! Looks really beautiful – even with the toys strewn about! Ha! You thumbnail popped out at me at Funky Junk’s party and I couldn’t resist clicking through. So glad I did! Thanks for the amazing inspiration! Love it! You’ve combined two of my favorite colors: gray & turquoise. Everything is coordinated so well! The gray paint really opens up the space too. Great job & thanks for sharing! Such a pretty room, love all the details, colors, mix of patterns and those board and batten walls. Great work! The beige wall looked great as it blends well with the furniture you have there in your living room. But I have to say that the current shade of your wall is much better. The place became more relaxing. Sometimes, you just have to experiment to see the ideal color to use in a certain room. I guess you’ve just found the perfect shade for your living room. Lucky you! Hehehe. What a fun living room! I really like the curtains, I’ve been thinking about stenciling some in a similar pattern. I also really like the rug and the board and batten, I’ve been trying to talk my husband into the board and batten in the bathroom, hehe. The bathroom sounds like a perfect place to start … a nice small project. 🙂 Good luck! Your living room is just perfect. I love your rug and curtains! WOW, the painted walls really do make all the difference. Not that the room was anything but great before, but that paint is PERFECT. I love everything about your space, did you make the curtains? If so, where did you get the fabric or where they purchased? New follower. Laura, What a beautiful room! 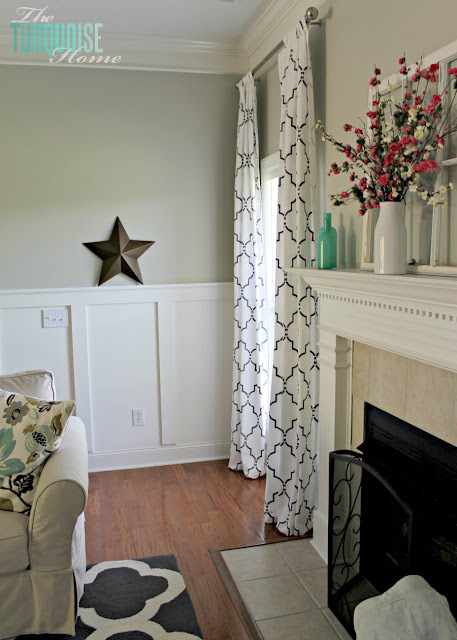 The paint and board and batten look fabulous and I love the rug and curtains. Thanks for sharing your pretty room at the Open House Party. Beautiful!!! Every detail is wonderful! I’m your newest follower! This is gorgeous! I’m so glad to have seen your post. 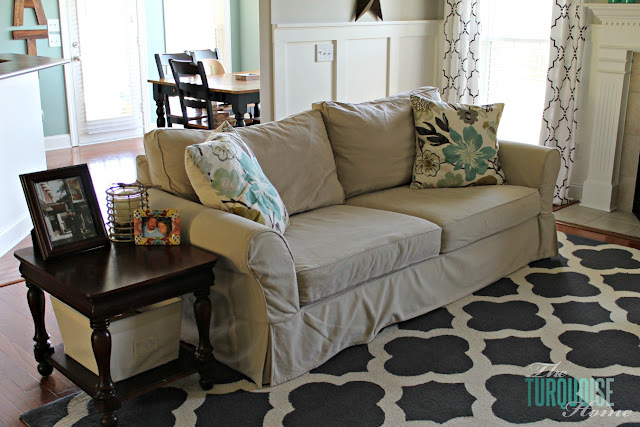 I’ve been considering buying that rug and it’s so nice to see it in a real room! What are your thoughts on it? The reviews said the charcoal has a bluish tint, but yours looks nice and gray. I love it. Your tv credenza is also a showstopper! You have pulled everything together beautifully and it’s nice to see that it’s “lived in!”. Hi Jennifer, thank you so much!! 🙂 I love, love, love the rug. It’s super comfy! It did shed quite a bit at first, but it’s toned down a LOT after much vacuuming. But that really didn’t bother me. 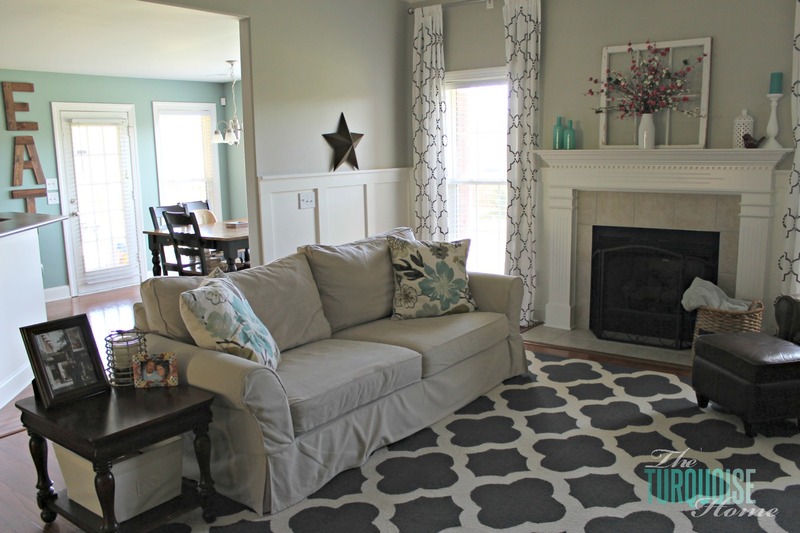 I do think the rug reads blue-ish sometimes, but that was fine with me since I love navy. And I plan to incorporate navy in my adjoining entry way. 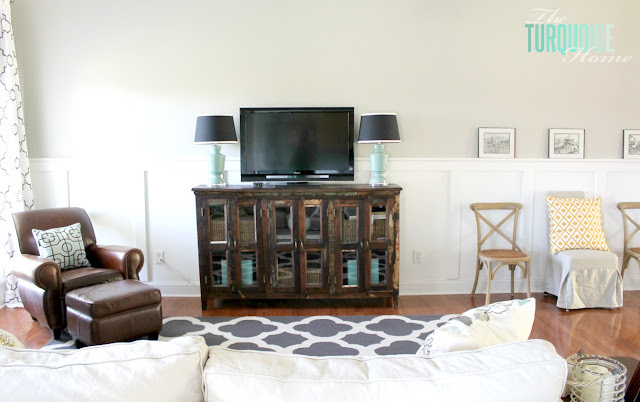 firstly, board and batten belongs in every room in the house:) secondly, that tv console is Amaaaaazing. thirdly, looove the curtains! what a fabulous space. What a beautiful room! 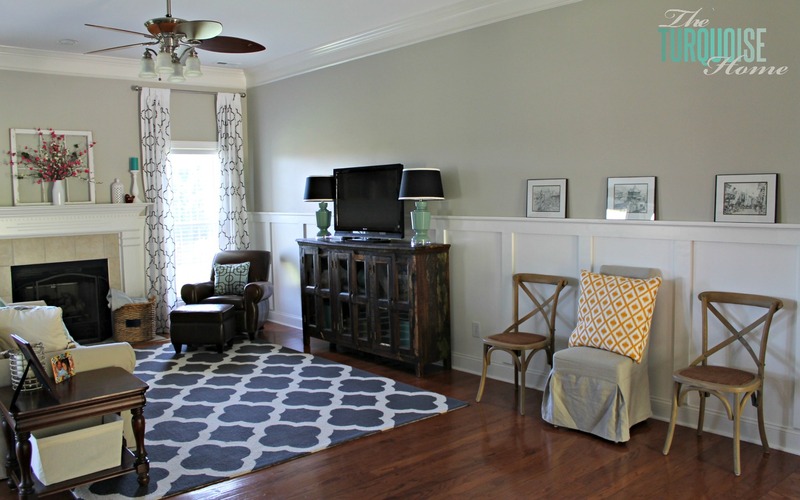 I love the wall color, board and batten and rug – they all work so well together. What is the color you used one the walls? LOVE! I absolutely LOVE your tour Laura! I would be tickled pink if you added Pretty Things at twelveOeight to your weekly party list (live now) hope you can make it! Hi Tanya, I just linked up. thanks for stopping by! Love it! The board and batten made a huge difference. We have it in our ensuite and just finished installing it in our hallway… still to be painted. 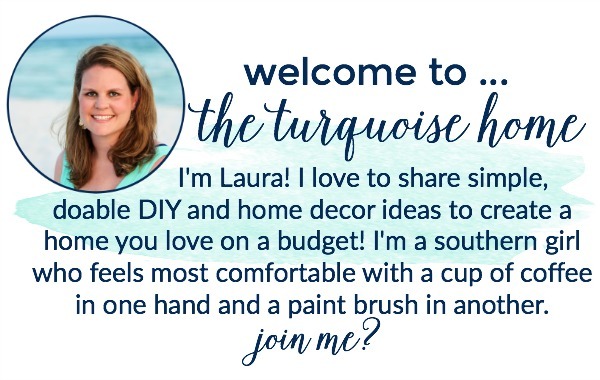 I love turquoise too, will have to explore the rest of your blog. Hopped over from Craft-o-maniac. I love the whole room! Where did you get the carpet? Hi Shelly, the rug is from rugsusa.com. I snagged it at their black Friday 75% off sale. 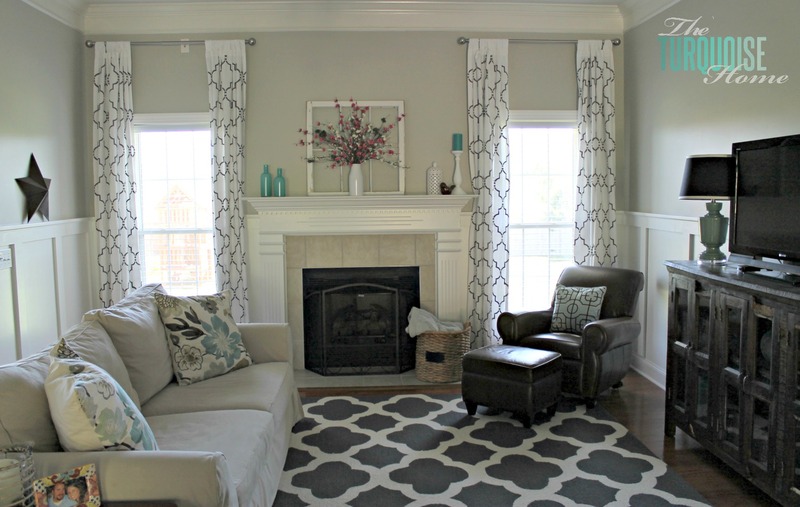 It’s the Neid Trellis rug in charcoal. I loved that rug, too! You did a beautiful job! that looks fabulous! the wall color isn’t so drastic, but it’s a definite change! i wish my boyfriend didn’t think once it’s done, it’s done, b/c i’d love to get rid of our beige. and it makes your rug look totaly different, too. great job! So beautiful! I love everything – especially all the pops of aqua. You did an amazing job! 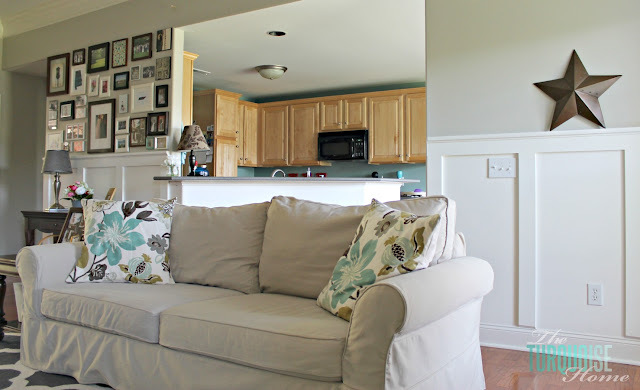 My family room is beige just like your before picture and now I want to paint it gray. Thanks for sharing all your great ideas. Laura, it is BEAUTIFUL!!! I LOVE it…and I LOVE the last picture. I can TOTALLY relate!! Great job…have a great weekend! Nice, very nice. Right out of a magazine. You did a lovely job. Beautiful!! Where are your curtains from? ?